Welcome to the second Nippon Day post. Here comes another detour from Washoku, again inspired by an experience I recently had. This time it was going to see the amazing performance of Duo YUMENO, the wonderful blend of two very talented musicians. Hikaru Tamaki, the son of a friend of mine, plays the cello (my all time favorite instrument). His wife, Yoko Reikano Kimura, plays the koto (my favorite Japanese instrument) and the shamisen, she also sings at times. I was lucky enough to see them at a church not too far from my house. I love music, but I don't often get the chance to listen to it locally, so I was thrilled when my friend told me that her son and daughter in law would be at the Congo Church in a few weeks. Japanese music is hauntingly beautiful, and so is the cello, the combination of the two sounded like it would be amazing. I was not disappointed. Not only was it a wonderful experience for my ears, but one for my eyes as well. I had never seen a koto being played, but it is as beautiful to watch as it is to hear. Yoko's hands moved over the strings like they were water, flowing seamlessly and expertly. Hikaru played with both a determined precision and a graceful art. It is a true joy to watch two such talented people, making something so difficult look so natural. I bought their album and have been listening to it every day since the concert. I am not a musician (though I like to sing when completely alone), but my mother's family is completely made up of them. All of my aunts and uncles play very well, and I used to sit and listen to my grandmother playing the piano for hours at a time. My mother loves music and while I was growing up played everything from Vivaldi to Westside Story to The Indigo Girls. I think that is why my taste is so varied today. With complete honesty I can say that I like a little of everything. However, I especially love classical music. The history of music in Japan is very long and complex, so I will focus on the two instruments that are used by Duo YUMENO, since I just saw them in action. The koto is a long stinged instrument, about seventy one inches long and made from kiri wood. It has thirteen moveable "bridges" which can be slid along the sting to change the sound. Picks are placed on the thumb, index finger, and middle finger in order to pluck the strings. The koto is the national instrument of Japan and has enjoyed a long history there, coming to the country in the 7th century via China. The very first known koto had five strings, which increased over time until the thirteen it has today. It grew in popularity as an instrument for court music, payed for and by the wealthy elite. The reputation of it being a romantic interment isn't hard to understand. The melodic sound accompanied with the hypnotic hands dancing across the strings is enough to turn anyone's head. There are many references to this power in Japanese literature, perhaps one of the best know being from "The Tales of Genji" when the title character falls in love with a stranger after hearing her play the koto. Just to be clear, he didn't see her playing it, the music was enough to capture his heart. In the 1600s the famous blind shamisen player Yatsuhashi Kengyo learned to play the koto. He tuned it to the sounds of Japanese folk music, changing the way that koto was played. Before his time the koto had been played as part of an accompaniment, but Yatsuhashi Kengyo popularized it as a solo instrument. Of the many songs he composed many are still popular today, including "Rokudan no Shirabe" which you can see played here. At the start of the Meiji period, when Japan again was open to the influences of western culture, a musician and innovator called Michio Miyagi (1894–1956) became the first composer to combine the Japanese koto and western music. He wrote over three hundred pieces in his lifetime and invented the seventeen stringed bass koto. I find the soulful music of the koto very moving. If I may be excused a flowery comparison, it is like having your heart stings plucked. I recommend listening to some koto music soon, and if possible, go to see it played live and get a good seat where you can really see it done. The shamisen came to Japan, also via china, a bit later than the koto, making it's debut sometime in the fifteen hundreds. It is a three stringed instrument, with a long neck and looks a bit like a Japanese banjo. The length and thickness varies depending on the genre of music, as the shamisen is used in a variety of styles. The bachi, a plectrum used to play the instrument, also varies according to genre. Wether played solo, in a group, in accompaniment, or as a part of kabuki or bunraku theatre, the shamisen always sounds amazing. 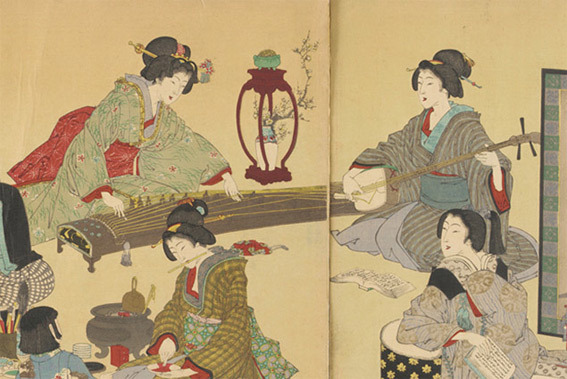 If you have read the book Memoirs of a Geisha, you will remember that the main character had to learn to play the shamisen as part of her training. The shamisen is indeed one of the instruments that a geisha may learn and is considered the hardest. Today, some of the traditional songs that geisha play are over three hundred years old. In the early twentieth century several musicians developed tsugaru-jamisen, a style based on traditional folk music. This very vibrant, upbeat style has been compared to American blue-grass banjo. It is still a very popular type of music in Japan today and I can see why, it is so much fun and extremely impressive. Here is a video of the Yoshida Brothers playing tsugaru-jamisen. If you watched the other video of the koto, you can see the difference quite clearly. The shamisen is a brusker, quicker instrument, the sort that makes you want to get up and dance. Or at least bop your head along to it vigorously. Beautiful and fun, the shamisen is another fantastic instrument. I hope that this brief account has inspired you to check out some Japanese music. If you'd like to see more, there are lots of videos of youtube. I recommend this one, which is a scene from the movie Tengu, and this one, which is part of a kabuki play and has many instruments (including the koto and shamisen) playing together. Until the next installment of Nippon Day, I hope that you will keep being curious about the fascinating culture of Japan!